Is The New 2018 Buick Enclave Avenir A Genuine Audi Q7 Competitor? Buick seems to think so. The first generation Buick Enclave three-row crossover was a smashing success, but it’s been on the market since 2008. Fortunately, Buick has just revealed the all-new 2018 Enclave at the New York Auto Show, as well as its new Avenir sub-brand. Conveniently enough, what you’re looking at is the Enclave Avenir, a supposed step up from the standard trims thanks to unique styling cues, premium materials throughout, and an even greater list of standard luxury features. Let’s start with the new Enclave itself. Based on the same platform underpinning the new Chevrolet Traverse, the 2018 Enclave has a sleeker, more aerodynamic look, thanks to its lower roofline and sharper windshield angle. The more sculpted bodylines are also quite nice. Buick claims it took advantage of an extensive use of LEDs that are integrated into the brand’s first application of Evonik Acrylite technology and bi-functional LED projector headlamps and LED tail lamps. There’s also a bunch of standard safety features including a rear vision camera, rear park assist and seven air bags. The interior is adorned with a 10-speaker Bose audio system and an air ionizer that eliminates odors and provides better overall air quality. Interior and cargo space has also been increased by 10 percent over the previous model, with 23.6 cubic feet of cargo space behind the third row. As for the Enclave Avenir, highlights includes an all-new body structure for enhanced safety, plus 17 radar, camera and ultrasonic sensors. A total of seven passengers can be accommodated, and Buick specifically points out there’s more cargo volume behind the first row than the Acura MDX, Audi Q7 and Infiniti QX60. There’s also an Avenir-exclusive 3-dimensional mesh grille, badging, and pearl nickel 20-inch aluminum wheels. 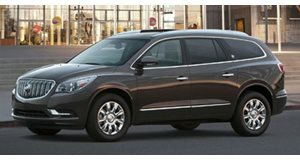 With an up to 5,000 pound towing capacity and a 3.6-liter V6 with 302 hp and 260 lb-ft of torque paired to a nine-speed automatic and available AWD, the 2018 Buick Enclave Avenir is definitely an interesting entry to the large luxury crossover segment. We don’t have exact pricing for either the base Enclave or the Enclave Avenir, but even the most expensive trim will undercut, or come close to, anything from the premium German brands – and that’s the whole point. Buick has been on a roll lately, and the new Enclave is vital to its future sales.